We are participating in THE MENS DEPT. The event will run from October 5th to October 31st. 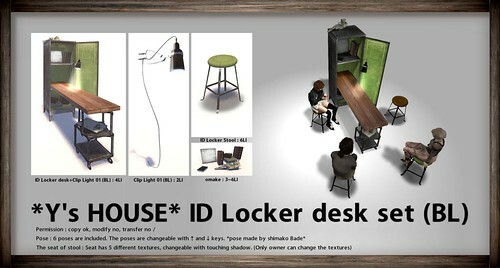 We have made a desk set with locker. 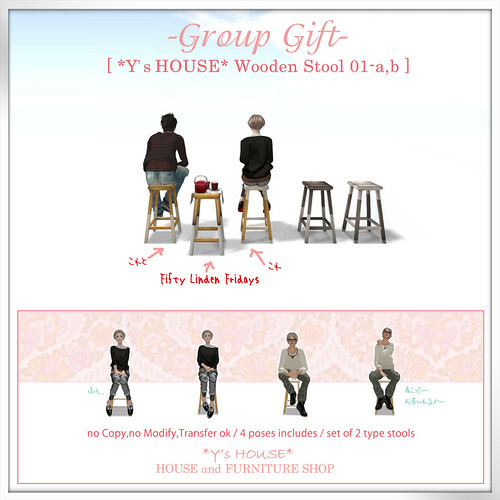 Some omakes (clip light , stool, and so on) are included in the package. * You can't put the clip light off. We are happy if you all have fun with it! And please visit other shops in this event too! * We have revised this item. And we send new version whom bought old one. If you haven't got new virsion, Please send yacchan Clip a note card with the transaction history ( please name the note card "requesting : new version"). Sorry for inconvenience and thank you for understanding. We had made Hot Green Tea set with heart patterns for last Fifty Linden Fridays. 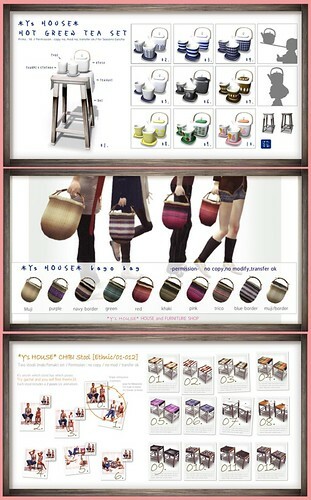 And this time, we have remaked stools of Hot Green Tea set by mesh.There are 2 kinds and 2 stools make one set. We set one of these as a group gift. The gift is at the yard in our main shop as usual. It's available from 2nd of Oct. to 8th of Oct.
After that, we are going to set a proper price on it. The price of Hot Green Tea set for ”Fifty Linden Fridays” remains 50L$ till 8th of Oct.
And we put some gachas which had been made for past event. -permission- no copy / no mod / transfer ok.
*You can change the poses with ↑or ↓ key. *The position adjusting system is not included. *These stools are made with mesh. Please use mesh-visible-viewer.